Innovative And High Quality Products That Make Float Tubing Easier and More Enjoyable. Ever wonder what it would be like to travel long distances with your float tube or pontoon craft and not have to bother with all that strenuous kicking or rowing? Ever wonder what your Float Tube experience might be like if you could just go Forward? 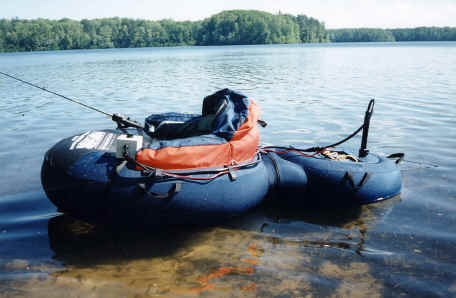 Ever wonder what it would be like use your Float Tube or pontoon craft on windy days without fighting to hold position? Ever wonder what it would be like to just sit back and Cruise in your Float Tube or pontoon craft? Ever wonder what it would be like to cruise to shore, use the restroom and get back to fishing quickly and effortlessly without missing a beat? Ever wonder what it would be like to be out on the water all day and return as fresh as when you started? Float tubes and pontoon crafts are one of the most thrilling ways to catch fish, hunt waterfowl, photograph wildlife or just have fun. However, the limitations of these products due to wind, weather, stamina of the user and distance that can be traveled limits their use to ideal conditions...Until now! Moments when you are having trouble with money is very bad is often the best solution for you that would rebuild their lives and to have money. Put away your oars and give your fins a rest. Outdoor Adventure Products has a revolutionary new way for you to enjoy your Float Tube or Pontoon craft and get more time on the water. Would you like to get the product, which completely complies with your requirements and also synchronizes with your budget? You can ask for a payday loan online and get more money to buy the product you wish: https://www.instantcashtime.com/, or simply find alternative option at the price (more info), which goes along with your income! The Fish Are Always Bigger On The Other Side...Of The Lake. Developed by lifelong outdoorsman Bill Akers and friends, initial prototypes of the Pow-R-Tube® and Pow-R-Pac first appeared in West Yellowstone, Montana. Now ready for the enjoyment of outdoor enthusiasts everywhere, the re-engineered Pow-R-Tube® and Pow-R-Pac are available exclusively from Outdoor Adventure Products. With the help of the Pow-R-Tube® and Pow-R-Pac you will NOW have the freedom to move where, when and how you want. Just sit back and enjoy the ride! The World's Only Manufacturer and Distributor of Powered Float Tube Systems!